Entek IRD International has been a leader in the development of software and hardware capabilities for vibration analysis for many years. Entek IRD began as Entek Scientific Corporation in 1981, and developed the first desktop computer-based program for use with spectrum analysis instrumentation. Over the years, Entek IRD has engineered many of the software capabilities common in predictive maintenance (PdM) systems today. In 1996, Entek Scientific Corporation acquired IRD Mechanics, and formed Entek IRD International. More than a quarter century of success in conception, design, production and marketing of technological advances for industrial maintenance and nondestructive testing make PRUFTTECHNIK AG a partner to be reckoned with! Through a network of subsidiaries and independent distributors in more than 70 countries worldwide, our customers have always played a vital role in shaping the tools that enhance everyday productivity. An example of this - laser optical alignment systems that deliver superior results with far less effort than conventional methods. Research and development is the highest priority, accounting for one-fifth of the staff and more than 200 international patents. This innovation has been accredited due accord in the marketplace as well, not only through immense customer popularity, but also with numerous awards at trade shows and from recognized authorities on industrial design. IRD Balancing has been in the balancing business for nearly 50 years. As IRD Mechanalysis, they set the industry standard for balancing machinery and instrumentation. Almost every major balancing innovation or technology started at IRD Balancing. Now, they are the only major manufacturer to offer a complete range of soft-bearing balancing machines, as well as a full line of instruments. They have more than 5000 systems installed in virtually every industrialized nation in the world. A global network of service, support applications expertise and training programs supports the systems they sell - including Balancing Service Company. IRD is a proven company that is charging into the future! You take pride in your facility, your team, and your work. You do what it takes to keep things up and running, but sometimes there is not enough time or resources to keep up with the workload, let alone be proactive about mechanical maintenance. 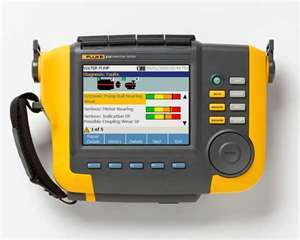 The Fluke 810 Vibration Tester puts you one step ahead by using a simple step-by-step process to report on machine faults the first time measurements are taken, without prior measurement history. The combination of diagnoses, severity and repair recommendations help you make informed maintenance decisions and address critical problems first. 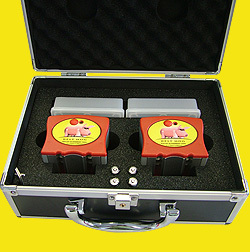 We use and recommend the belt hog for anyone with belt alignment needs. Since this unit centers in the belt groove it is very easy to use, even with the belts on. Most belt alignments are a one man job with this tool. It works with size A to E belts and has an accessory pack available for cogged belts.